Split system air conditioners are the right solution to keep your home always at the ideal temperature. They are perfect for heating or cooling bedrooms, living rooms, open-space apartments, all without wasting energy and money. Crown Electrical Service will install the ideal split system air conditioner to meet the needs of your home and your family. With Crown Electrical Service you are in safe hands: a licensed electrician will take care of the installation of your split system air conditioner in all safety, making sure electrical wiring complies with health and safety national requirements. A split system air conditioner is made up of two main parts, one installed outside the house and one inside. The inside parts are what you see and operate and are available in wall mounted or floor standing models. 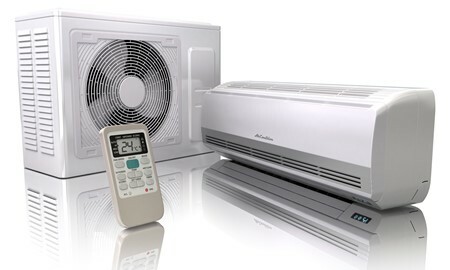 Split systems types come in ‘cooling only’ models or ‘reverse cycle’, which have settings for both cooling and heating. You may also notice the term ‘inverter’ which means the split system has the capability of adjusting itself to the temperature that you set. A very handy feature! Split system air conditioning is not as pricey as you think: mounting and installation is usually not expensive, as there is no duct work involved, and state of the art technology has allowed consume costs to be significantly reduced, bringing them down to as little as 10 cents an hour. Modern split system air conditioners produce very little noise and are ideal also for bedrooms. Moreover, they come in a series of sleek designs and are less bulky than in the past, so they will not ruin the elegance of your home. Easy to remove filters make maintenance simple and safe. 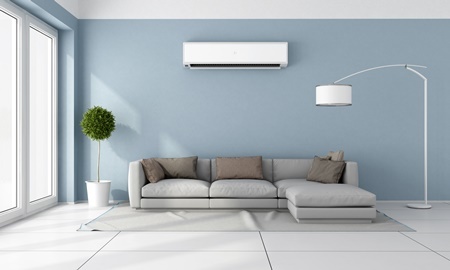 Split system air conditioners can be mounted high up on walls, they can stand on the floor or be fitted directly into your ceiling: to each home its own! A ‘reverse cycle’ split system has the added benefit of being able to both cool and heat your home. This is a very handy feature for all year round comfort.